Ideal for Hebrew Roots people. and we help you do it right. Painted dark blue, with a raw hide thong to hook "upon thy weapon", and a Solomonic gold band around the end of the handle, this is a feces paddle worthy of a king. 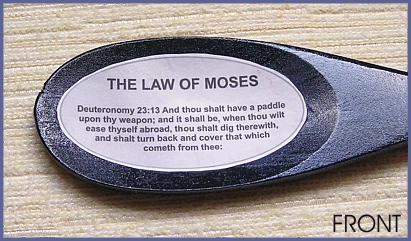 The front and back of the spoon have the Old Testament and New Testament teachings on the doctrine of the feces paddle so that no sincere Law Keeper can miss the great urgency of carrying one of these sacred instruments. Someone will say, "Look here now, the feces paddle was for the days when sanitation was not as developed as it is now in modern times, so the feces paddle is obsolete." The point is, the feces paddle is not just to cover "what cometh from thee," it is a mark of a faithful Law Keeper. 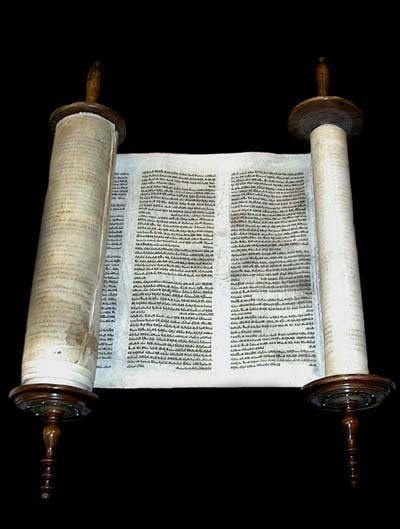 To cast aside even one law of Moses is to defy the doctrine of salvation by works. If you intend to save yourself by works, you need to add every possible accouterment of the Old Covenant. on the paddle below which makes the doctrine of the feces paddle clear. Liberty by faith in Christ Jesus. Fundamental Baptists who insist on keeping "Baptist Standards"
in the teachings of Jesus Christ or the Apostle Paul revoking this law. to obey God and carry a feces paddle. devotion to Law and return to live a life of Liberty in Christ Jesus. when they see your feces paddle? Find the email address here. in case we miss the PayPal notification. 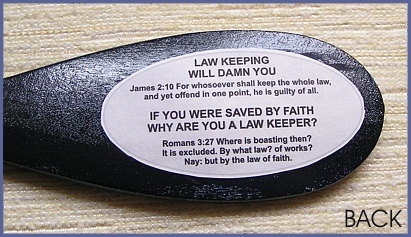 who is not rejoicing that you are a Law Keeper. in the liberty of Grace. To our friends.... If someone wants to donate a button machine, we could add a lampoon Law Keeper's, and a Grace Keeper's, button to wear in the marketplace and to the church house. These would be great for wearing while walking around at an SDA or Hebrew Roots event. SEND MAIL if you would like to donate a good used button machine.